The 16Right ADS-B stations use one seven element, and two nine element coaxial co-linear omni-directional antennas. Two of the antennas were built by Dave at DPD Productions in California USA, and the other custom built by Grahame Hutchison. 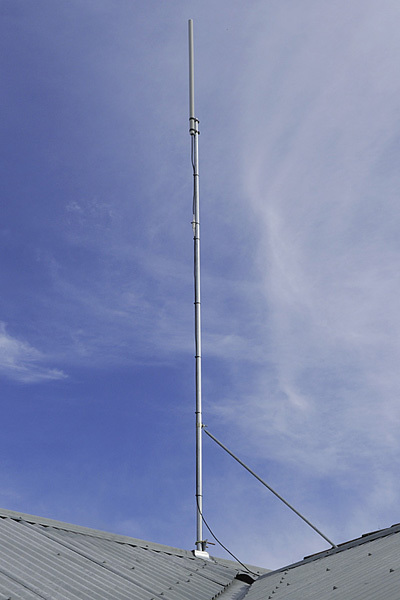 The antennas are connected using LMR-400 coaxial cable, with a runs of 1 to 10m. N-connectors are used for the two joints, with one connecting to the antenna fly lead, and the other connecting to a short adapter lead into the Software Defined Radio. The FlightAware Pro Stick Plus is tuned to 1090MHz to receive ADS-B signals, and digitise the output for the signal processing and decoding software. FlightAware's Pro Stick Plus consists of a high-performance USB R820T2 SDR with a build in RF amp, and, an onboard filtering. Raspberry Pi's are used to perform signal processing, decoding, data processing, and synchronisation with the 16Right server. The Raspberry Pi 3 Model B has a Quad Core 1.2GHz CPU with 1GB of RAM, and network connectivity via Ethernet and Wifi. It provides an extremely reliable platform capable of 24 / 7 / 365 operation. Dump1090 is an ADS-B decoder program transforming raw ADS-B signal data from the RTLSDR decoder into several ease-to-consume data formats. Data is outputted on TCP/IP ports, which allows multiple clients to access and process the data in parallel. It also provides single and double bit error correction, which assists in decoding weak distant signals. To provide the data for this website, a custom written Node.js application reads data streamed from Dump1090. After performing numerous processes on the received data, it is synchronised to the 16Right server. Combining data from all three ADS-B stations enables features such as: Live Flights, Live Map, and Sydney Airport (SYD) Status. Currently, data is uploaded to 16Right ADSB from three locations in the Sydney region, providing coverage of more than 235nm from Sydney International Airport in all directions. Each station provides unique coverage, outlined below, as well as providing redundancy for each other. Station A provides coverage from the North-East via South to the North-West, as well as significantly extended oceanic reception when Tropospheric Ducting occurs. Station B has an even coverage in all directions, including most ground traffic at Sydney International Airport. Station C focuses on traffic to the west, and on the ground at Sydney International Airport. If you have any questions regarding this website please contact us at adsb@16right.com. We will respond as quickly as possible, whether you have a question or issue/improvement for this site. From the first data upload and basic website, this project has evolved and advanced, becoming increasingly complex and useful to an increasingly large base of users. In the future I hope to further develop 16Right ADS-B to become even more informative to a broader range of end users, with a variety of new enhancements acting as the motivation for the continued development of this site. Thank you to CASA (Australia) for answering questions regarding the continued development of this site, and providing material relating to ADS-B operations in Australia. Thank you to Planespotter.net for allowing 16Right to utilise their global network of aircraft images. Thanks also must also go to contributors to Planespotter.net for making it such a comprehensive network of aircraft photography. Thank you to LiveATC.net for allowing 16Right to utilise their YSSY Airport ATC Tower and Arrivals/Departures Live Audio Feeds.